In spite of their flaws, in spite of the underachievement by the players that were expected to be really good, the Boston Red Sox are a fun team to watch and a fun team to root for in 2016. For the first time since 2013, the Red Sox are still in the pennant race in the middle of August, and that’s a refreshing change of pace for a die hard fan of America’s Regional Pastime. As shaky as the pitching has been this year, the offense has carried the Red Sox more often than it hasn’t, and while David Ortiz is still amazing, and still an enormous part of what the Red Sox do offensively, this summer the torch has been passed to a new great hitter, and you wouldn’t know by looking at him. Markus Lynn “Mookie” Betts, the Red Sox outfielder who will turn 24 in October, is doing everything he can to crash the season-long party that has been David Ortiz’ farewell tour in the best ways possible for the sake of the team. The Red Sox have an exciting core in the Four Bs (I’m still workshopping the nickname. I’m not married to it. It doesn’t roll off the tongue the way The Core Four does. Why do the Yankees always get to have nice things? I’m open to suggestions): Betts, Xander Bogaerts, Jackie Bradley Jr., and recently called up Andrew Benintendi. While all four received varying levels of hype, Betts has been the most consistent since getting called up to the Majors in 2014, and his ability to hit for power like this has shocked the baseball world to the point where Dave Cameron (not to be confused with David Cameron, the recently resigned British prime minister) of Fangraphs wrote this week about how Betts has defied the comparisons people like him have wanted to compare him to in his professional baseball career. Mookie Betts has 28 home runs already this year (he hit 18 home runs in 2015, his first full Major League season), and has had two multi-home run games just this week, hitting three home runs against the Arizona Diamondbacks and becoming only the second Red Sox player to have multiple three home run games in a single season (the other was some guy named Ted Williams), and then a two home run game against the division rival Baltimore Orioles in which Mookie drove in all five runs for Boston in their crucial 5-3 win at Camden Yards. He’s not just hitting for power, but he’s hitting for power in big moments. That’s ripped straight from the David Ortiz playbook, but that’s where the Papi/Mookie comparisons stop. Ortiz is a left-handed hitter, while Betts is a right-handed hitter. Ortiz was a low-risk free agent signing after the Minnesota Twins wrote him off, while Betts was drafted by the Red Sox in 2011, and developed in their farm system ahead of schedule. Ortiz was crushing baseballs and giving fans hope for reversing the Curse of the Bambino when I was still in middle school, while Betts is younger than I am. Most of all, Ortiz is a bulky, lumbering 6’3″ beast of a man who gets opposing fans and pitchers alike shaking at their knees by his mere presence in the batter’s box, while Betts is a slight 5’9″, looks like Steph Curry to Papi’s LeBron, and is still getting underestimated by much of the competition. Other than that, they’re exactly the same. It really amazing how much power Betts is packing into such a small body, and it’s refreshing to see a guy who can hit like that who can also move the way he does, both in the field and running the bases. Usually the Red Sox have guys who are one or the other. Guys like David Ortiz, Manny Ramirez, Ted Williams if you want to go back that far, they were all great hitters for average as well as power, but you also hold your breath whenever the ball is hit their way. Guys like Johnny Damon and Jacoby Ellsbury were all speed, but were never much in the way of power hitters. Betts is the best of both worlds, and he’s younger than me, shorter than me, faster than me (not that anyone cares), is making exponentially less money than Jacoby Ellsbury is right now with New York, and he’s still wearing a linebacker’s number as if he just got called up to Boston last week (One thing I always find mildly interesting is unconventional number/player combinations. 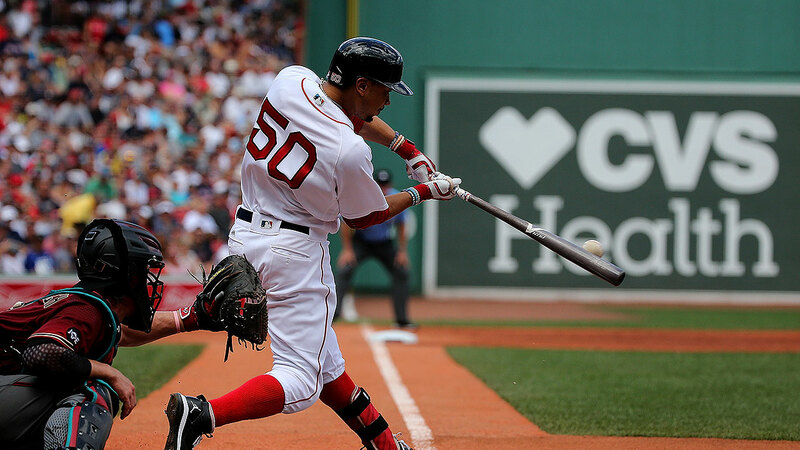 I like it when an established, every day player still wears a high number like a recent call-up like Betts is wearing #50, or when Manny Ramirez chose #99 when he was with the Dodgers. Xander Bogaerts wore #72 in the 2013 World Series, but changed it to #2 the next year after Ellsbury signed with the Yankees, for instance. I also really like Sandy Leon this year. Partly because he’s been crushing everything that crosses the plate lately, and partly because he’s a catcher who has bounced between Boston and Pawtucket the last two years, but has a single digit jersey. How did he pull that off? Who in the Red Sox organization does he have dirt on?)! This may be David Ortiz’ year, and he’s earned the right to be celebrated the way he has, but Mookie Betts has shown us this year that the Red Sox’ offense will be in good hands even after Big Papi retires, and it’s going to be a lot of fun along the way. If the Red Sox make the playoffs, Mookie Betts has a chance to win the American League MVP, especially since Mike Trout’s Angels are out of the picture (On a side note, it’s amazing how fast the baseball writers who vote on awards took Trout for granted. Guys like Peyton Manning and LeBron James both had to win three or four MVPs in their respective sports before people got sick of voting for them, and Trout only won once and before getting passed up in favor of Josh Donaldson last year. Trout should be really be mad at the Angels’ front office for not putting a better team around him. Donaldson won because the helped the Blue Jays end a 22 year postseason drought. Mike Trout only turned 25 a couple weeks ago and he’s already in danger of being the best player to have his prime squandered by an incompetent baseball operations department since Ted Williams, who only made the postseason once in his career, when the Red Sox lost to the St. Louis Cardinals in seven games in the 1946 World Series, but even then, Ted played in an era when only one team in the American League made the playoffs every year. Trout’s Angels have five times as many chances! Sorry about that. Moving on. ), but even if he doesn’t win, Mookie Betts is the most exciting thing to happen to the Red Sox since their fans got used to the idea of winning the World Series before they die. This isn’t the best Red Sox team we’ve ever seen, but it sure is a good time.